WILLEMSTAD - The Parliament of Curacao has deliberated on the Consensus Statute Laws during their recent public meeting. At the end of the debate, the opposition parties presented a motion in which they urged the Prime Minister to give a report to Parliament on the status of the evaluation process of the consensus laws. The motion also calls for the appointment of a special committee to finalize the evaluation of these consensus laws. The motion was rejected with 13 against and 6 in favor. 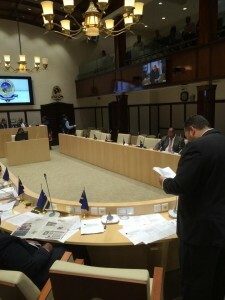 The MPs, Charles Cooper, Hensly Koeiman (both MPs for MAN), Gerrit Schotte, Amerigo Thode, Gilmar Pisas and Monique Felida (all MFK), have signed the motion, which was presented at the end of the meeting. Parliament has the urgency to replace these laws with our own laws, just as it was the case in the Netherlands Antilles. The motion was rejected when the coalition and two members of the opposition voted against it.